A simple story set in a simpler time. Set in the fantastical Renaissance world of Don Juan and Miguel, richly costumed characters come together to create a humorous tale of mystery and danger. Featuring sword fights, a chase scene on horseback and a monster, THE TALE OF EL GUSANO will delight audiences of all ages. 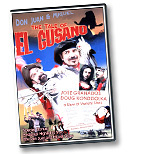 Jose Granados as Don Juan and Douglas Kondziolka as Miguel, veterans of the Renaissance Festival circuit, now also as BLIND DOG ENTERTAINMENT, invite you to celebrate with them this first in a series of family-friendly, action adventure shorts. With appearances by over 50 of the most memorable and wacky characters ever to bless a Renaissance Festival, El Gusano has been created completely by the inhabitants of our unique community. Jose Granados as Don Juan, and Douglas Kondziolka as Miguel, Brutus, and El Gusano. Sarina Stone as Lady Maria, Dakota Star Granados as Esmeralda, Baj Burinski as our Queen, Matt Connolly, Duncan Pace and Louis Skaradek of The London Broil as the Minions, Shannon O�Brien and Dana McCain of Hey! Nunnie! Nunnie! As the Queen�s Sidekicks, and a slew of variety talent, including Ded Bob, Zilch the Tory Steller, Fool Hearty, Smee and Blogg, The Wacky Chickens, and many more! B.D.E. is proud to present this first dvd in a series of family-friendly action adventure comedies! Filmed on Location at the Arizona Renaissance Festival.